Sony Xperia NXT smartphone range in pictures | What Hi-Fi? Sony today announced two new smartphones at Mobile World Congress in Barcelona, the Xperia P and Xperia U. 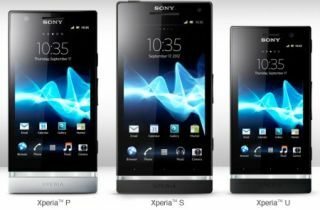 Together with the flagship Xperia S they form the three-strong Xperia NXT mobile family. All three smartphones have the transparent illumination bar that can change colour for notifications and according to the colour of what's on screen, from album artwork to pictures. As well as a choice of colours for the illumination light, there's a choice of colours for the detachable base at the foot of the smartphone. The phones themselves meanwhile are available in a choice of black or white. The Xperia range all use the Android OS but with some unique Sony touches. The smartphones all have access to Sony's Music Unlimited service, which offers over 15 million tracks to stream as well as an iTunes Match style service for uploading and accessing your music on the cloud. No word on the exact dimensions but in the hand the Xperia P is compact and slim, as you can see from the pictures below. The phones use Sony's new Reality Display, powered by the Sony Bravia Engine. Also on board are Clear Audio and xLOUD Sony audio technologies. The Xperia P is the first and currently only Sony smartphone to use the company's new WhiteMagic display for superior pictures in bright light. The Sony Xperia U meanwhile is the most compact of the three smartphones but still features the illumination light and the detachable base. Scroll down for more pictures of the smallest handset in the Sony Xperia range, the Xperia U. It has a 3.5in screen, 5MP camera, dual core 1GHz processor and a choice of colour caps. The Xperia P and Xperia U are due out in the middle of Q2 this year.